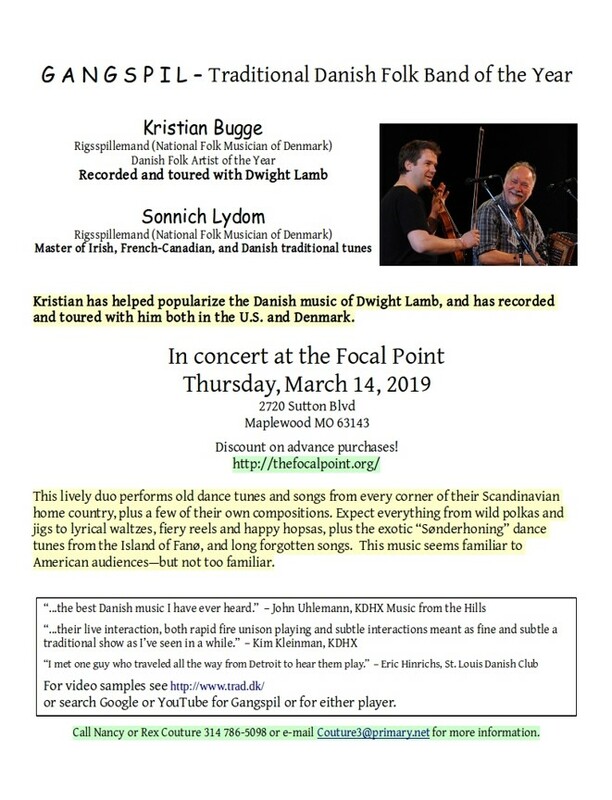 Come see Gangspil, the Traditional Danish Folk Band of the Year, in concert at the Focal Point in Maplewood on Thursday, March 14, 2019. 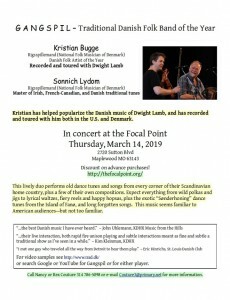 This lively duo performs old dance tunes and songs from every corner of their Scandinavian home country, plus a few of their own compositions. Expect evrything from wild polkas and jigs to lyrical waltzes, fiery reels and happy hopsas, plus the exotic “Sonderhoning” dance tunes from the Island of Fano, and long forgotten songs. This music seems familiar to American audiences – but not too familiar. Call Nancy or Rex Couture (314) 786-5098 or email couture3@primary.net for more information.